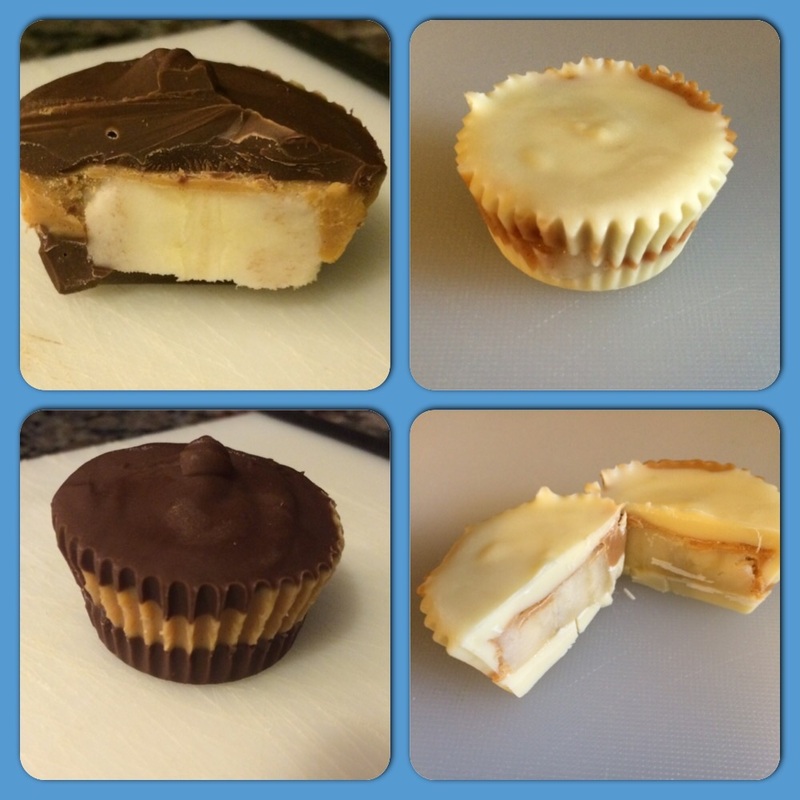 July 20, 2015 July 20, 2015 Sarah M.
Stumbled upon a great (and seemingly easy) recipe for peanut butter cups with banana. While I’m often skeptical of recipes posted on IG & blogs, I thought I’d give this one a try. My husband is a Reese’s junky and we had tons of bananas courtesy of my father who thinks my 8 month old consumes produce at an alarmingly unrealistic rate. All you need to make these is coconut oil, peanut butter (could easily be substituted with almond or soynut butter), chocolate chips, and bananas! I made a batch of white chocolate and milk chocolate cups. My husband made sure to sneak and devour the majority of them while I was at Muay Thai. According to him you haven’t lived until you’ve wrapped them in bacon. Place the liners into a mini cupcake pan (preferably one that you can easily slide into your freezer). If you do not have a mini cupcake pan, double up the liners for stability and place in any flat bottom baking dish. Melt chips in a double boiler or if you so chose you can melt them in the microwave. If you go the microwave route be sure to remove them every 30 seconds to stir. White chocolate seizes up easily so be careful not to overheat the mixture if you choose to go this route. Once the chips are melted, add a 1/2 tsp. of coconut oil to the mixture. Spoon approximately 1 tsp. of the chocolate mixture into the bottom of each liner, followed by a slice of banana, a tsp. of the peanut mixture, and then top with the chocolate mixture. Cool cups in the freezer for about an hour or until firm, then ENJOY! Be careful not to leave out of freezer (especially since it’s summer), the mixture melts easily and will leave for messy snacking.